Well its a new year peeps and we’re back with a whole slew (not really) of new posts and info and things that we can’t wait to share with you! So to start off the year of (impending doom?) 2012, I made it my resolution (one of many) to learn how to dance, and where do amateur dancers like myself turn to to learn such an art?? YOUTUBE!! Haha, yes YT is full of “how to” videos including dance and so on that fateful search I came upon THIS! Who says Asians can’t dance? Well, obviously, they can! This series of dance offs(?) are split into three rounds so far and I think it’s uploaded once a month since the newest round isn’t uploaded yet. You can watch ALL the dance teams and all the rounds at Dance@Hero Japan YT Channel. I can honestly say that they improve so much over the span of the three rounds. Keep an eye out for my favourite teams: タイムマシーン and Team Black Starz 龍太郎! Attn: Apologies before hand to all non-spanish speakers; since these videos aren’t subtitled/translated you might have a terrible time understanding anything but I felt like sharing these vids for those who will understand; KTHNXBAI! Been severely busy these past few days My new college courses are keeping me on my toes and rather ignorant of anything that isn’t about stocks, trades, and money, but tonight I was feeling stressed and absolutely nostalgic. So to let off some steam I went “funny videos” hunting on Youtube and fortunately I found this Vlog! Its created by a guy, Gabriel Montiel, who claims that his Vlog’s goal is to make his watchers laugh and have a good time. And I must say he does a great job! Now, naturally this bowl/pot effect isn’t totally exclusive to Japanese cats (I’m sure other cats do it too) however they are the ones that take time to record it, lol. Isn’t it just sooo cute?! I might have more cat videos later for your bored viewing! PS: none of this is translated because my Japanese fails <__<"
I’ve been on a roll this week! Two dramas watched and I’m moving on to the next one! 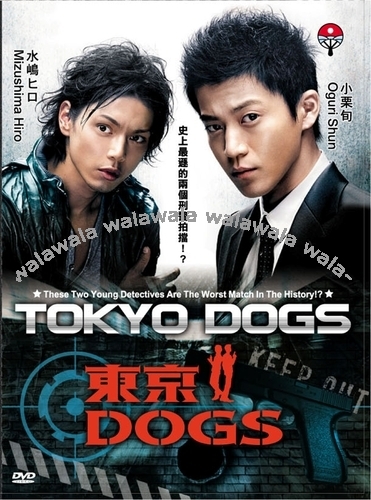 This times Jdrama is called Tokyo Dogs with Oguri Shun (<3 crows zero 1-2, hana yori dango 1-2, zettai kareshi, gokusen) and Mizushima Hiro (zettai kareshi, hana kimi, lovely complex, mr. brain)! Today GD posted on his me2day “Big Bang is Back! Tonight!” along with a video!! Ugh I’m so excited!